The four-engine 747 uses a double deck configuration for part of its length. It is available in passenger, freighter and other versions. Boeing designed the 747's hump-like upper deck to serve as a first class lounge or (as is the general rule today) extra seating, and to allow the aircraft to be easily converted to a cargo carrier by removing seats and installing a front cargo door. Boeing did so because the company expected supersonic airliners (whose development was announced in the early 1960s) to render the 747 and other subsonic airliners obsolete, while believing that the demand for subsonic cargo aircraft would be robust into the future. The 747 in particular was expected to become obsolete after 400 were sold but it exceeded its critics' expectations with production passing the 1,000 mark in 1993. As of June 2010, 1,418 aircraft have been built, with 109 more in various configurations remaining on order. The 747-400, the latest version in service, is among the fastest airliners in service with a high-subsonic cruise speed of Mach 0.85-0.855 (up to 570 mph, 920 km/h). It has an intercontinental range of 7,260 nautical miles (8,350 mi or 13,450 km). The 747-400 passenger version can accommodate 416 passengers in a typical three-class layout or 524 passengers in a typical two-class layout. The newest version of the aircraft, the 747-8, is in production and flight testing in late 2010. Deliveries of the 747-8F freighter version are scheduled to begin in mid-2011, with the 747-8I passenger version to follow in late 2011. The 747 is to be replaced by the Boeing Y3 (part of the Boeing Yellowstone Project) in the future. In 1963, the United States Air Force started a series of study projects on a very large strategic transport aircraft. Although the C-141 Starlifter was being introduced, they felt that a much larger and more capable aircraft was needed, especially the capability to carry outsized cargo that would not fit in any existing aircraft. These studies led to initial requirements for the CX-Heavy Logistics System (CX-HLS) in March 1964 for an aircraft with a load capacity of 180,000 pounds (81,600 kg) and a speed of Mach 0.75 (500 mph/805 km/h), and an unrefueled range of 5,000 nautical miles (9,260 km) with a payload of 115,000 pounds (52,200 kg). The payload bay had to be 17 feet (5.18 m) wide by 13.5 feet (4.11 m) high and 100 feet (30.5 m) long with access through doors at the front and rear. All three of the airframe proposals shared a number of features. As the CX-HLS needed to be able to be loaded from the front, a door had to be included where the cockpit usually was. All of the companies solved this problem by moving the cockpit to above the cargo area; Douglas had a small "pod" just forward and above the wing, Lockheed used a long "spine" running the length of the aircraft with the wing spar passing through it, while Boeing blended the two, with a longer pod that ran from just behind the nose to just behind the wing. In 1965 Lockheed's aircraft design and General Electric's engine design were selected for the new C-5 Galaxy transport, which was the largest military aircraft in the world at the time. The nose door and raised cockpit concepts would be carried over to the design of the 747. The 747 was conceived while air travel was increasing in the 1960s. The era of commercial jet transportation, led by the enormous popularity of the Boeing 707 and Douglas DC-8, had revolutionized long-distance travel. Even before it lost the CX-HLS contract, Boeing was pressed by Juan Trippe, president of Pan American World Airways (Pan Am), one of its most important airline customers, to build a passenger aircraft more than twice the size of the 707. During this time, airport congestion, worsened by increasing numbers of passengers carried on relatively small aircraft, became a problem that Trippe thought could be addressed by a large new aircraft. In April 1966, Pan Am ordered 25 747-100 aircraft for US$525 million. During the ceremonial 747 contract-signing banquet in Seattle on Boeing's 50th Anniversary, Juan Trippe predicted that the 747 would be "... a great weapon for peace, competing with intercontinental missiles for mankind's destiny", according to Malcolm T. Stamper, one of the senior management for the 747 program at the time. As launch customer, and because of its early involvement before placing a formal order, Pan Am was able to influence the design and development of the 747 to an extent unmatched by a single airline before or since. Ultimately, the high-winged CX-HLS Boeing design was not used for the 747, although technologies developed for their bid had an influence. The original design included a full-length double-deck fuselage with rows of eight-across seating and two aisles on the lower deck and seven-across seating and two aisles on the upper deck. However, concern over evacuation routes and limited cargo-carrying capability caused this idea to be scrapped in early 1966 in favor of a wider single deck design. The cockpit was, therefore, placed on a shortened upper deck so that a freight-loading door could be included in the nose cone; this design feature produced the 747's distinctive "bulge". In early models it was not clear what to do with the small space in the pod behind the cockpit, and this was initially specified as a "lounge" area with no permanent seating. Picture - The Pratt & Whitney JT9D high-bypass turbofan engine was developed for the 747. One of the principal technologies that enabled an aircraft as large as the 747 to be conceived was the high-bypass turbofan engine. The engine technology was thought to be capable of delivering double the power of the earlier turbojets while consuming a third less fuel. General Electric had pioneered the concept but was committed to developing the engine for the C-5 Galaxy and did not enter the commercial market until later. Pratt & Whitney was also working on the same principle and, by late 1966, Boeing, Pan-Am and Pratt & Whitney agreed to develop a new engine, designated the JT9D to power the 747. The project was designed with a new methodology called fault tree analysis, which allowed the effects of a failure of a single part to be studied to determine its impact on other systems. To address concerns about safety and flyability, the 747's design included structural redundancy, redundant hydraulic systems, quadruple main landing gear and dual control surfaces. Additionally, some of the most advanced high-lift devices used in the industry were included in the new design, in order to allow it to operate from existing airports. These included leading edge flaps running almost the entire length of the wing, as well as complex three-part slotted flaps along the rear. The wing's complex three-part flaps increase wing area by 21% and lift by 90% when fully deployed compared to their non-deployed configuration. Boeing agreed to deliver the first 747 to Pan Am by the end of 1969. The delivery date left 28 months to design the aircraft, which was two-thirds the normal time. The schedule was so fast paced that the people who worked on it were given the nickname "The Incredibles". Developing the aircraft was such a technical and financial challenge that management was said to have "bet the company" when it started the project. As Boeing did not have a plant large enough to assemble the giant airliner, they chose to build a new plant. The company considered locations in about 50 cities, and eventually decided to build the new plant some 30 miles (48 km) north of Seattle on a site adjoining a military base at Paine Field near Everett, Washington. It bought the 780-acre (316 hectare) site in June 1966. Developing the 747 had been a major challenge, and building its assembly plant was also a huge undertaking. Boeing president William M. Allen asked Malcolm T. Stamper, then head of the company's turbine division, to oversee construction of the Everett factory and to start production of the 747. To level the site, more than 4 million cubic yards (3.1 million m�) of earth had to be moved. Time was so short that the 747's full-scale mock-up was built before the factory roof above it was finished. The plant is the largest building by volume ever built, and has been substantially expanded several times to permit construction of other models of Boeing widebody commercial jets. Before the first 747 was fully assembled, testing began on many components and systems. One important test involved the evacuation of 560 volunteers from a cabin mock-up via the aircraft's emergency chutes. The first full-scale evacuation took two and a half minutes instead of the maximum of 90 seconds mandated by the Federal Aviation Administration, and several volunteers were injured. Subsequent test evacuations achieved the 90-second goal but caused more injuries. Most problematic was evacuation from the aircraft's upper deck; instead of using a conventional slide, volunteer passengers escaped by using a harness attached to a reel. Tests also involved taxiing such a large aircraft. Boeing built an unusual training device known as "Waddell's Wagon" (named for a 747 test pilot, Jack Waddell) that consisted of a mock-up cockpit mounted on the roof of a truck. While the first 747s were still being built, the device allowed pilots to practice taxi maneuvers from a high upper-deck position. On 30 September 1968, the first 747 was rolled out of the Everett assembly building before the world's press and representatives of the 26 airlines that had ordered the airliner. Over the following months, preparations were made for the first flight, which took place on February 9, 1969, with test pilots Jack Waddell and Brien Wygle at the controls and Jess Wallick at the flight engineer's station. Despite a minor problem with one of the flaps, the flight confirmed that the 747 handled extremely well. The 747 was found to be largely immune to "Dutch roll", a phenomenon that had been a major hazard to the early swept-wing jets. During later stages of the flight test program, flutter testing showed that the wings suffered oscillation under certain conditions. This difficulty was partly solved by reducing the stiffness of some wing components. However, a particularly severe high-speed flutter problem was solved only by inserting depleted uranium counterweights as ballast in the outboard engine nacelles of the early 747s. This measure caused anxiety when these aircraft crashed, as did China Airlines Flight 358 at Wanli in 1991 and El Al Flight 1862 at Amsterdam in 1992. The flight test program was hampered by problems with the 747's JT9D engines. Difficulties included engine stalls caused by rapid movements of the throttles and distortion of the turbine casings after a short period of service. The problems delayed 747 deliveries for several months and stranded up to 20 aircraft at the Everett plant while they awaited engine installation. The program was further delayed when one of the five test aircraft suffered serious damage during a landing attempt at Renton Municipal Airport, site of Boeing's Renton plant. The test aircraft was being taken to have its test equipment removed and a cabin installed when pilot Ralph C. Cokely undershot the short runway and sheared off the 747's landing gear. However, these difficulties did not prevent Boeing from taking one of the test aircraft to the 28th Paris Air Show in mid-1969, where it was displayed to the general public for the first time. The 747 achieved its FAA airworthiness certificate in December 1969, making it ready for introduction into service. Picture - First Lady Pat Nixon visits the cockpit of the first commercial 747 during the christening ceremony, January 15, 1970. The huge cost of developing the 747 and building the Everett factory meant that Boeing had to borrow heavily from a banking syndicate. During the final months before delivery of the first aircraft, the company had to repeatedly request additional funding to complete the project. Had this been refused, Boeing's survival would have been threatened. Ultimately, the gamble succeeded, and Boeing held a monopoly in very large passenger aircraft production for many years. On January 15, 1970, First Lady of the United States Pat Nixon christened Pan Am's first 747, Clipper Victor, at Dulles International Airport (later renamed Washington Dulles International Airport) in the presence of Pan Am chairman Najeeb Halaby. Instead of champagne, red, white and blue water was sprayed on the aircraft. The 747 entered service on January 22, 1970, on Pan Am's New York-London route; the flight had been planned for the evening of January 21, but engine overheating made the original aircraft unusable. Finding a substitute delayed the flight by more than six hours to the following day. The 747 enjoyed a fairly smooth introduction into service, overcoming concerns that some airports would not be able to accommodate an aircraft that large. Although technical problems occurred, they were relatively minor and quickly solved. After the aircraft's introduction with Pan Am, other airlines that had bought the 747 in order to stay competitive began to put their own 747s into service. Boeing estimated that half of the early 747 sales were to airlines requiring the aircraft's long range rather than its payload capacity. While the 747 had the lowest potential operating cost per seat, this could only be achieved when the aircraft was fully loaded; costs per seat increased rapidly as occupancy declined. A moderately loaded 747, one with only 70 percent of its seats occupied, used more than 95 percent of the fuel needed by a fully occupied 747. When economic problems in the United States and other countries after the 1973 oil crisis led to reduced passenger traffic, several airlines found they did not have enough passengers to fly the 747 economically, and they replaced them with the smaller and recently introduced McDonnell Douglas DC-10 and Lockheed L-1011 TriStar trijet wide bodies (and later the 767 and A300 twinjets). Having tried replacing coach seats on its 747s with piano bars in an attempt to attract more customers, American Airlines eventually relegated its 747s to cargo service and in 1983 exchanged them with Pan Am for smaller aircraft; Delta Air Lines also removed its 747s from service after several years. International flights that bypassed traditional hub airports and landed at smaller cities became more common throughout the 1980s, and this eroded the 747's original market. However, many international carriers continued to use the 747 on Pacific routes. In Japan, 747s on domestic routes are configured to carry close to the maximum passenger capacity. After the initial 747-100 model, Boeing developed the -100B, a higher maximum takeoff weight (MTOW) variant, and the -100SR (Short Range), with higher passenger capacity. Increased maximum takeoff weight can allow an aircraft to carry more fuel and have longer range. The -200 model followed, entering service in 1971. It featured more powerful engines and higher takeoff weight. Passenger, freighter and combination passenger-freighter versions were produced. The shortened 747SP (special performance) with a longer range was also developed in the mid-1970s. The 747 line was further developed with the launching of the 747-300 in 1980. The -300 resulted from Boeing studies to increase the seating capacity of the 747. Solutions such as fuselage plugs and extending the upper deck over the entire length of the fuselage were rejected. The early designation of the -300 was 747SUD for "stretched upper deck", then 747-200 SUD, followed by 747EUD, before the 747-300 designation was used. The -300 model was first produced in 1983. It included a stretched upper deck, increased cruise speed and increased seating capacity. Passenger, short range and combination freighter-passenger versions were produced. Picture - The 747-400 entered service in 1989, with Air New Zealand among the first operators of the type. In 1985, development of the longer range 747-400 began. The new variant had a new glass cockpit, which allowed for a cockpit crew of two instead of three. Development cost soared, and production delays occurred as new technologies were incorporated at the request of airlines. Insufficient workforce experience and reliance on overtime contributed to early production problems on the 747-400. The -400 entered service in 1989. Picture - A size comparison of four large aircraft: Spruce Goose (gold), Antonov An-225 (green), Airbus A380 (pink), and a 747-8 (blue). In 1991, a record-breaking 1,087 passengers were airlifted aboard a 747 to Israel as part of Operation Solomon. 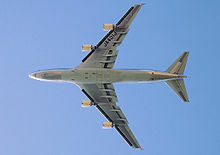 The 747 was the heaviest airliner in regular service until the use of the Antonov An-124 Ruslan in 1982. The 747-400ER model regained that distinction in 2000. The Antonov An-225 cargo transport remains the world's largest aircraft by several measures (including the most accepted measures of maximum takeoff weight and length); one has been completed and is in service as of 2010. The Hughes H-4 Hercules is the largest aircraft by wingspan, but it only flew once. Since the arrival of the 747-400, several stretching schemes for the 747 have been proposed. Boeing announced the larger 747-500X and -600X preliminary designs in 1996. The new variants would have cost more than $5 billion to develop, and interest was not sufficient to launch the program. Boeing offered the more modest 747X and 747X stretch derivatives in 2000 as alternatives to the Airbus A3XX. However, the 747X family was unable to attract enough interest to enter production. Boeing switched from the 747X studies to pursue the Sonic Cruiser in 2001 and, after the Sonic Cruiser program was put on hold, the 787. Some of the ideas developed for the 747X were used on the 747-400ER. On November 14, 2005, Boeing announced it was launching the 747 Advanced as the Boeing 747-8. The last 747-400s were completed in 2009. As of 2011, most orders of the 747-8 have been for the freighter variant. On February 8, 2010, the 747-8 Freighter made its maiden flight. The first scheduled delivery of the 747-8 will be to Cargolux in mid-2011. Eventually, the 747 may be replaced in Boeing's lineup by a new design dubbed "Y3". The 747 has multiple structural redundancy including four redundant hydraulic systems and four main landing gears with four wheels each, which provide a good spread of support on the ground and safety in case of tire blow-outs. The redundant main gear allows for landing on two opposing landing gears if the others do not function properly. In addition, the 747 has split control surfaces and sophisticated triple-slotted flaps that minimize landing speeds and allow the 747 to use standard-length runways. 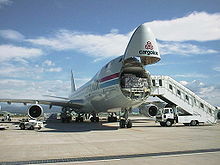 For transportation of spare engines, 747s can accommodate a non-functioning fifth-pod engine under the port wing of the aircraft between the nearest functioning engine and the fuselage. The 747-100 was the original variant launched in 1966. The 747-200 soon followed, with an order in 1968. The 747-300 was launched in 1980 and was followed in 1985 by the 747-400. Ultimately, the 747-8 was announced in 2005. Several versions of each variant have been produced. Many of the early variants were in production simultaneously. The first 747-100s were built with six upper-deck windows (three per side) to accommodate upstairs lounge areas. Later, as airlines began to use the upper-deck for premium passenger seating instead of lounge space, Boeing offered a 10-window upper deck as an option. Some -100s were retrofitted with the new configuration. The -100 was equipped with Pratt & Whitney JT9D-3A engines. No freighter version of this model was developed by Boeing. However, 747-100s have been converted to freighters. A total of 167 747-100s were built. Responding to requests from Japanese airlines for a high-capacity aircraft to serve domestic routes between major cities, Boeing developed the 747SR as a "short range" variant of the 747-100 with lower fuel capacity and greater payload capability. With increased economy class seating, up to 498 passengers could be carried in early versions and more than 550 in later models. The 747SR had an "economic design life objective" of 52,000 flights during 20 years of airline operation, compared to 20,000 flights in 20 years for the standard 747. The initial 747SR model, the -100SR, had a strengthened body structure and undercarriage to accommodate the added stress accumulated from a greater number of takeoffs and landings. Extra structural support was built into the wings, fuselage, and the landing gear along with a 20% reduction in fuel capacity. The initial order for the -100SR, four aircraft for Japan Air Lines (JAL, later Japan Airlines), was announced on October 30, 1972; rollout occurred on August 3, 1973, and the first flight took place on August 31, 1973. The type was certified by the FAA on September 26, 1973, with the first delivery on the same day. The -100SR entered service with JAL, the type's sole customer, on October 7, 1973, and typically operated Japanese domestic flights. Seven -100SRs were built from 1973 and 1975, each with a 520,000-pound (240,000 kg) MTOW and Pratt & Whitney JT9D-7A engines derated to 43,000 pounds-force (190,000 N) of thrust. Following the -100SR, Boeing produced the -100BSR, a 747SR variant with increased takeoff weight capability. Debuting in 1978, the -100BSR also incorporated structural modifications for a high cycle-to-flying hour ratio; a related standard -100B model debuted in 1979. The -100BSR first flew on November 3, 1978, with first delivery to All Nippon Airways (ANA) on December 21, 1978. A total of 20 -100BSRs were produced for ANA and JAL. The -100BSR had a 600,000 lb MTOW and was powered by the same JT9D-7A engines used on the -100SR. ANA operated the type on domestic Japanese routes with 455 or 456 seats until retiring its last aircraft on March 10, 2006. The 747-100B model was developed from the -100SR, utilizing its stronger airframe and undercarriage design. The type had an increased fuel capacity of 48,070 US gallons, allowing for a 5,000-nautical-mile (9,300 km; 5,800 mi) range with a typical 452-passenger payload, and an increased MTOW of 750,000 lb (340,000 kg) was offered. The first -100B order, one aircraft for Iran Air, was announced on June 1, 1978. This aircraft first flew on June 20, 1979, received FAA certification on August 1, 1979, and was delivered the next day. Nine -100Bs were built, one for Iran Air and eight for Saudia (now Saudi Arabian Airlines). Unlike the original -100, the -100B was offered with Pratt & Whitney JT9D-7A, General Electric CF6-50, or Rolls-Royce RB211-524 engines. However, only RB211-524 (Saudia) and JT9D-7A (Iran Air) engines were ordered. The idea for the 747SP came from a joint request between Pan American World Airways and Iran Air, who were looking for a high-capacity airliner with enough range to cover Pan Am's New York-Middle Eastern routes and Iran Air's planned Tehran-New York route. The Tehran-New York route when launched was the longest non-stop commercial flight in the world. The 747SP is 48 feet 4 inches (14.73 m) shorter than the 747-100. Fuselage sections were eliminated fore and aft of the wing, and the center section of the fuselage was redesigned. The SP's flaps used a simplified single-slotted configuration. The 747SP, compared to earlier variants, had a tapering of the aft upper fuselage into the empennage, a double-hinged rudder, and longer vertical and horizontal stabilizers. Power was provided by Pratt & Whitney JT9D-7(A/F/J/FW) or Rolls-Royce RB211-524 engines. The 747SP was granted a supplemental certificate on February 4, 1976 and entered service with Pan Am, the launch customer and Iran Air, that same year. The aircraft was chosen by airlines wishing to serve major airports with short runways. A total of 45 747SPs were built. The 44th 747SP was delivered on August 30, 1982. Boeing re-opened the 747SP production line to build one last 747SP five years later in 1987 for an order by the United Arab Emirates government. In addition to airline use, one 747SP was modified for NASA Dryden Flight Research Center's SOFIA experiment. The series 100 powered by Pratt & Whitney JT9D-3A engines offered enough payload and range for US domestic operations, but it was marginal for long international route sectors. This demand for longer range aircraft with increased payload quickly led to improved series 200. The 747-200 has more powerful engines, increased MTOW, and greater range than the -100. In its first three years of production, the series 200 featured Pratt & Whitney JT9D-7 engines (initially the only engine available). A few early -200s retained the three-window configuration of the -100 on the upper deck, but most were built with a 10-window configuration on each side. Several variants of the -200 were produced. The 747-200B was the basic passenger version, with increased fuel capacity and more powerful engines; it entered service in February 1971. Range with a full passenger load started at 5000+ nmi (9000+ km) and increased to 6000 nmi with later engines. The 747-200F is the freighter version of the -200 model. It could be fitted with or without a side cargo door. It has a capacity of 105 tons (95.3 tonnes) and an MTOW of up to 833,000 lb (378,000 kg). It entered service in 1972 with Lufthansa. The 747-200C Convertible is a version that can be converted between a passenger and a freighter or used in mixed configurations. The seats are removable, and the model has a nose cargo door. The -200C could be fitted with an optional side cargo door on the main deck. The 747-200M is a combination version that has a side cargo door on the main deck and can carry freight in the rear section of the main deck. A removable partition on the main deck separates the cargo area at the rear from the passengers at the front. This model can carry up to 238 passengers in a 3-class configuration if cargo is carried on the main deck. The model is also known as the 747-200 Combi. As on the -100, a stretched upper deck (SUD) modification was later offered. A total of 10 converted 747-200s were operated by KLM. Union des Transports A�riens (UTA) also had two of these aircraft converted. After launching the series 200 with Pratt & Whitney JT9D-7 engines, on August 1, 1972 Boeing announced that it had reached an agreement with General Electric to certify the 747 with CF6-50 series engines to increase the aircraft's market potential. 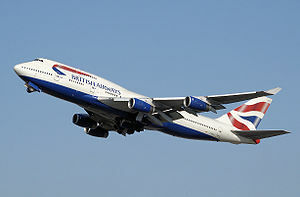 Rolls-Royce followed 747 engine production with a launch order from British Airways for four aircraft. The option of RB211-524B engines was announced on June 17, 1975. The series 200 was the first 747 to become available with a choice of engine manufacturer, which Boeing maintained for the type until the introduction of the 747-8. A total of 393 of the 747-200 versions had been built when production ended in 1991. Of these, 225 were 747-200s, 73 were 747-200F, 13 were 747-200C, 78 were 747-200M, and 4 were military. Many 747-200s remain in operation, although most large carriers have retired them from their fleets and sold them to smaller operators. Large carriers have sped up fleet retirement following the September 11th attacks and the subsequent drop in demand for air travel, scrapping some or turning others into freighters. The most visible difference between the -300 and previous models was a stretched upper deck with two new emergency exit doors and an optional flight-crew rest area immediately aft of the flight deck as standard. Compared to the -200, the upper deck is 23 feet 4 inches (7.11 m) longer. 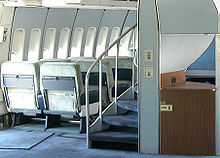 The stretched upper deck had previously been offered as a retrofit and first appeared on two Japanese 747-100SR aircraft. The -300 has a new straight stairway to the upper deck instead of a spiral staircase on earlier variants. The staircase creates room below and above for more seats. With minor aerodynamic changes, Boeing increased the -300's cruise speed to Mach 0.85 from Mach 0.84 on the -200 and -100 models. The -300 features the same takeoff weight. For available engines on the -300, the Pratt & Whitney and Rolls-Royce engine versions were unchanged from the -200, but the General Electric engine changed to the CF6-80C2B1 version. The 747-300 name, which was first used in a design study that was later shelved, was revived for this version, which was introduced in 1980. Swissair ordered the first 747-300 on June 11, 1980. The 747-300 first flew on 5 October 1982. Swissair was the first customer to accept delivery on March 23, 1983. In addition to the passenger version, other versions were available. The 747-300M has cargo capacity in the rear portion of the main deck similar to the -200M, but with the stretched upper deck it can carry more passengers. The 747-300SR is a short range version to meet the need for a high-capacity domestic model. Japan Airlines operated such aircraft with more than 600 seats on the Okinawa-Tokyo route and elsewhere. Boeing never launched a newly built freighter version of the 747-300, but it modified used passenger -300 models into freighters starting in 2000. A total of 81 aircraft were delivered, 56 for passenger use, 21 -300M and 4 -300SR versions. The 747-300 was soon superseded by the more advanced 747-400 in 1985, just two years after the -300 entered service. The last 747-300 was delivered in September 1990 to Sabena. Today, many -300 aircraft are still active, despite several large carriers that replaced their 747-300s with 747-400s. Air France, Air India, Pakistan International Airlines and Qantas were some of the last major carriers to operate the 747-300. On December 29, 2008, Qantas flew its last scheduled 747-300 service, operating from Melbourne to Los Angeles via Auckland. Picture - British Airways operates the largest fleet of 747s in the world. The addition of winglets is a noticeable difference between most -400s and earlier variants. The 747-400 is an improved model with increased range. It has wing-tip extensions of 6 ft (1.8 m) and winglets of 6 ft (1.8 m), which improve the 747-400's fuel efficiency by 4% compared to previous 747 versions. It has a new glass cockpit designed for a flight crew of two instead of three. 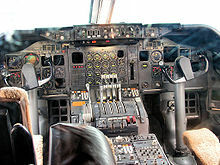 The use of electronics reduced the number of dials, gauges and knobs from 971 to 365. It has tail fuel tanks, revised engines and a new interior. The longer range was used by some airlines to bypass traditional fuel stops, such as Anchorage. Powerplants include the Pratt & Whitney PW4062, General Electric CF6-80C2, and Rolls-Royce RB211-524. The -400 was offered in passenger (-400), freighter (-400F), combi (-400C), domestic (-400D), extended range passenger (-400ER) and extended range freighter (-400ERF) versions. The freighter version does not have an extended upper deck. The 747-400D was built for short range operations and does not include winglets, but these can be retrofitted. Cruising speed is up to Mach 0.855 on different versions of the 747-400. The passenger version first entered service in February 1989 with launch customer Northwest Airlines on the Minneapolis to Phoenix route. The combi version entered service in September 1989 with KLM. The freighter version entered service in November 1993 with Cargolux. The 747-400ERF entered service in October 2002 and the 747-400ER entered service the following month with Qantas, the only airline ever to order the passenger version. Some of the last built Boeing 747-400s were delivered with Dreamliner livery along with the modern Signature interior from the Boeing 777. In January 2004 Boeing and Cathay Pacific launched the Boeing 747-400 Special Freighter program, later referred to as the Boeing Converted Freighter (BCF). The first 747-400BCF was redelivered in December 2005. The last passenger version of the 747-400 was delivered in April 2005 to China Airlines. Boeing announced in March 2007 that it had no plans to produce further passenger versions of the -400. However, orders for 36 -400F and -400ERF freighters were already in place at the time of the announcement. A total of 694 of the 747-400 series aircraft had been delivered. At various times, the largest operator of the 747-400 has been Singapore Airlines, Japan Airlines, or British Airways. Picture - The Boeing 747 Large Cargo Freighter, also called Dreamlifter, is modified from 747-400s previously in airline use. The 747-400 Dreamlifter (originally called the 747 Large Cargo Freighter or LCF) is a Boeing-designed modification of existing 747-400s to a larger configuration to ferry Boeing 787 Dreamliner sub-assemblies to the Boeing plant in Everett, Washington, for final assembly. Evergreen Aviation Technologies Corporation of Taiwan was contracted to complete modifications of 747-400s into Dreamlifters in Taiwan. 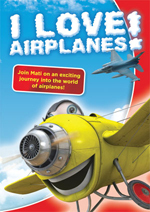 The aircraft flew for the first time on September 9, 2006. The Dreamlifter's only intended purpose is to transport sub-assemblies for the Boeing 787. The aircraft is certified to carry only essential crew and not passengers. Modification of four aircraft was completed by February 2010. Boeing announced a new 747 variant, the 747-8 (referred to as the 747 Advanced prior to launch) on 14 November 2005. The variant will use the same engine and cockpit technology as the 787, hence the use of the "8". Plans call for the new design to be quieter, more economical and more environmentally friendly. The 747-8's fuselage was lengthened from 232 to 251 feet (70.8 to 76.4 m). When the 747-8 enters service, it will surpass the Airbus A340-600 as the world's longest airliner. The 747-8 is equipped with General Electric GEnx-2B67 engines. The 747-8 Freighter version or 747-8F is derived from the 747-400ERF. The 747-8F can accommodate 154 tons (140 tonnes) of cargo. To aid loading and unloading, it features an overhead nose-door. It has 16 percent more payload capacity than the 747-400F and can hold seven additional standard air cargo containers. The 747-8 Freighter made its maiden flight on February 8, 2010. Deliveries of the 747-8F are to begin in mid-2011. The passenger version, named 747-8 Intercontinental or 747-8I, will be able to carry up to 467 passengers in a 3-class configuration and fly more than 8,000 nmi (15,000 km) at Mach 0.855. As a derivative of the already common 747-400, the 747-8 has the economic benefit of similar training and interchangeable parts. The 747-8I is to begin deliveries in late 2011. The first test flight was on March 20, 2011. Several units are under construction at Boeing's Everett facility. The 747-8 has received 107 total orders with 74 for the -8F, and 33 for the -8I as of February 2011. C-19 - The U.S. Air Force gave this designation to the 747-100s used by some U.S. airlines and modified for use in the Civil Reserve Airlift Fleet. VC-25 - This aircraft is the U.S. Air Force Very Important Person (VIP) version of the 747-200B. The U.S. Air Force operates two of them in VIP configuration as the VC-25A. Tail numbers 28000 and 29000 are popularly known as Air Force One, which is technically the air-traffic call sign for any United States Air Force aircraft carrying the U.S. President. Although based on the 747-200B design, they include several innovations introduced on the 747-400. Partially completed aircraft from Everett, Washington, were flown to Wichita, Kansas, for final outfitting. E-4B - Formerly known as the National Emergency Airborne Command Post (referred to colloquially as "Kneecap"), this aircraft is now referred to as the National Airborne Operations Center (NAOC). YAL-1 - This is the experimental Airborne Laser, a component of the National Missile Defense plan. 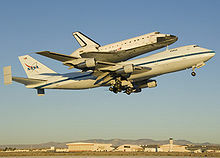 Shuttle Carrier Aircraft - Two 747s were modified to carry the Space Shuttle. One is a 747-100 (N905NA), and the other is a 747-100SR (N911NA). An SCA carried the Space Shuttle Enterprise in the late 1970s, and has since carried all Space Shuttles. Picture - 20-1101 Japanese Air Force One, one of the two customized Boeing 747-400s that have been part of the Japan Air Self-Defense Force since 1993. C-33 - This aircraft was a proposed U.S. military version of the 747-400 intended to augment the C-17 fleet. The plan was canceled in favor of additional C-17 military transports. KC-33A - A proposed 747 was also adapted as an aerial refueling tanker and was bid against the DC-10-30 during the 1970s Advanced Cargo Transport Aircraft (ACTA) program that produced the KC-10A Extender. Before the Khomeini-led revolution, Iran bought four 747-100 aircraft with air-refueling boom conversions to support a fleet of F-4 Phantoms. It is unknown whether these aircraft remain usable as tankers. Since then, other proposals have emerged for adaptation of later 747-400 aircraft for this role. 747 CMCA - This variant was considered by the U.S. Air Force as a Cruise Missile Carrier Aircraft during the development of the B-1 Lancer strategic bomber. It would have been equipped with 50 to 100 AGM-86 ALCM cruise missiles on rotary launchers. This plan was abandoned in favor of more conventional strategic bombers. Picture - Proposed "airborne aircraft carrier" 747 variant. 747 AAC - Boeing also considered developing the 747 into an aerial aircraft carrier for up to 10 "microfighters". With a double-decker hangar and two launching bays, it was believed that the scheme might actually be cheaper than establishing a short-term land base. 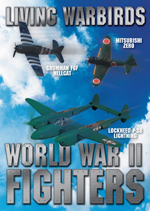 However nothing came of the scheme, or its complementary 747 AWACS version, which would have carried two of the "microfighters" for reconnaissance. Evergreen 747 Supertanker - A Boeing 747-200 modified as an aerial application platform for fire fighting using 20,000 US gallons (76,000 L) of firefighting chemicals. The 747-500X concept featured an increased fuselage length of 18 ft (5.5 m) to 250 ft (76.2 m) long, and the aircraft was to carry 462 passengers over a range up to 8,700 nautical miles (10,000 mi, 16,100 km), with a gross weight of over 1.0 Mlb (450 Mg). The 747-600X concept featured a greater stretch to 279 ft (85 m) with seating for 548 passengers, a range of up to 7,700 nmi (8,900 mi, 14,300 km), and a gross weight of 1.2 Mlb (540 Mg). A third study concept, the 747-700X, would have combined the wing of the 747-600X with a widened fuselage, allowing it to carry 650 passengers over the same range as a 747-400. The cost of the changes from previous 747 models, in particular the new wing for the 747-500X and -600X, was estimated to be more than $5 billion. Boeing was not able to attract enough interest to launch the aircraft. As Airbus progressed with its A3XX study, Boeing in 2000 offered the market a 747 derivative as an alternative. This was a more modest proposal than the previous -500X and -600X that would retain the 747's overall wing design and add a segment at the root, increasing the span to 229 ft (69.8 m). Power would have been supplied by either the Engine Alliance GP7172 or the Rolls-Royce Trent 600, which were also proposed for the 767-400ERX. A new flight deck based on the 777's would be used. The 747X aircraft was to carry 430 passengers over ranges of up to 8,700 nmi (10,000 mi, 16,100 km). The 747X Stretch would be extended to 263 ft (80.2 m) long, allowing it to carry 500 passengers over ranges of up to 7,800 nmi (9,000 mi, 14,500 km). Both would feature an interior based on the 777's signature architecture. 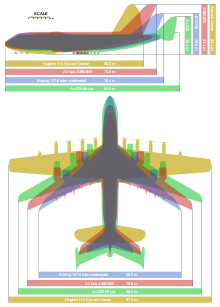 Freighter versions of the 747X and 747X Stretch were also studied. Like its predecessor, the 747X family was unable to garner enough interest to justify production, and it was shelved along with the 767-400ERX in March 2001, when Boeing announced the Sonic Cruiser concept. Though the 747X design was less costly than the 747-500X and -600X, it was criticized for not offering a sufficient advance from the existing 747-400. The 747X did not make it beyond the drawing board, but the 747-400X being developed concurrently moved into production to become the 747-400ER. Data through March, 2011, table updated April 8, 2011. Few crashes have been attributed to design flaws of the 747. The Tenerife disaster resulted from pilot error, air traffic control (ATC) error and communications failure, while the Japan Airlines Flight 123 and China Airlines Flight 611 crashes stemmed from improper aircraft repair. United Airlines Flight 811, which suffered an explosive decompression mid-flight on 24 February 1989, led the National Transportation Safety Board (NTSB) to issue a recommendation that 747-200 cargo doors similar to those on the Flight 811 aircraft be modified. Korean Air Lines Flight 007 was shot down by the Soviets in 1983 after it had strayed into Soviet territory, causing U.S. President Ronald Reagan to authorize the then-strictly military Global Positioning System (GPS) for civilian use. TWA Flight 800, a 747-100 that exploded in midair on July 17, 1996, led the Federal Aviation Administration to propose a rule requiring installation of an inerting system in the center fuel tank of most large aircraft that was adopted in July 2008, after years of research into solutions. It is expected that the new safety system will cost $100,000 to $450,000 per aircraft and weigh approximately 200 pounds (91 kg). Picture - Boeing 747-200B on display at the Technikmuseum Speyer in Germany. As increasing numbers of "classic" 747-100 and 747-200 series aircraft have been retired, some have found their way into museums or other uses. The City of Everett, the first 747 and prototype is at the Museum of Flight, Seattle, Washington, USA where it is sometimes leased to Boeing for test purposes. Other 747s in museums include those at the National Aviation Theme Park Aviodrome, Lelystad, Netherlands; the Qantas Founders Outback Museum, Longreach, Queensland, Australia; Rand Airport, Johannesburg, South Africa; Technikmuseum Speyer, Speyer, Germany; Mus�e de l'Air et de l'Espace, Paris, France; Tehran Aerospace Exhibition, Tehran, Iran; Jeongseok Aviation Center, Jeju, South Korea, Evergreen Aviation & Space Museum, McMinnville, Oregon, and the National Air and Space Museum, Washington, D.C. Upon its retirement from service, the 747 number two in the production line was dis-assembled and shipped to Namyangju, Gyeonggi-do, South Korea where it was re-assembled and converted into a restaurant. Originally flown commercially by Pan Am as N747PA "Clipper Juan T. Trippe", and repaired for service following a tailstrike, it stayed with the airline until its bankruptcy. The 747 restaurant closed by 2009, and the B747 was demolished in 2010. The Jumbohostel, using a converted 747-200, opened at Arlanda Airport, Stockholm on January 15, 2009. The 747 parasitic drag, CDP, is 0.022, and the wing area is 5,500 square feet (511 m), so that f equals about 121 sq ft or 11.2 m�. The parasitic drag is given by � f ρair v� in which f is the product of drag coefficient CDp and the wing area. Following its debut, the 747 rapidly achieved iconic status, appearing in various film productions such as the Airport series of disaster films, Air Force One and Executive Decision. The 747 was also referenced in the Earth, Wind & Fire song Let's Groove. Itabashi, M., K. Kawata and S. Kusaka. "Pre-fatigued 2219-T87 and 6061-T6 aluminium alloys." Structural Failure: Technical, Legal and Insurance Aspects. Milton Park, Abingdon, Oxford, UK: Taylor & Francis, 1995. 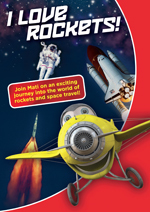 ISBN 978-0-419-20710-8. Kane, Robert M. Air Transportation: 1903-2003. Dubuque, IA: Kendall Hunt Publishing Company, 2004. 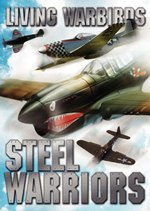 ISBN 0-7575-3180-6. Norris, Guy and Mark Wagner. 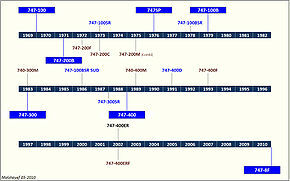 Boeing 747: Design and Development since 1969. St. Paul, Minnesota: MBI Publishing Co., 1997. ISBN 0-7603-0280-4. Orlebar, Christopher. The Concorde Story. Oxford, UK: Osprey Publishing, Fifth edition, 2002. ISBN 1-85532-667-1.